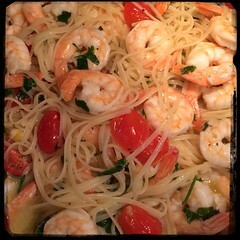 Adding shrimp or prawns to the classic Aglio e Olio pasta sauce creates a wonderfully delicious and classic variation. 1. Cooking your pasta (al dente) – just before you add the pasta to the salted boiling water you can begin making the sauce. 2. Heat 4 tbsp olive oil in a sauce pan over medium heat, add the minced garlic and anchovies. Cook until color of the garlic begins to brown (be careful not to burn the garlic, it will turn bitter). 3. Add the shrimp and let cook until the translucency of the shrimp fades into a more opaque white. 4. Add the wine and let come to a simmer before adding the tomatoes. 6. When the pasta is almost ready, take a bit of the pasta water and add to the sauce pan. This will help the sauce adhere to the pasta better. Combine the pasta with the sauce in the sauce pan. 7. Toss in the pasta, mix well.8. Fold in 3 tbsp of olive oil, the chopped parsley, and salt and pepper (to taste). 9. Add the freshly squeezed lemon juice and mix well. Try folding in some fresh arugula before serving.